I cannot even pronounce that first part of this gluten-free friendly restaurant in Vegas, but those are some freaky looking fish, are they not? 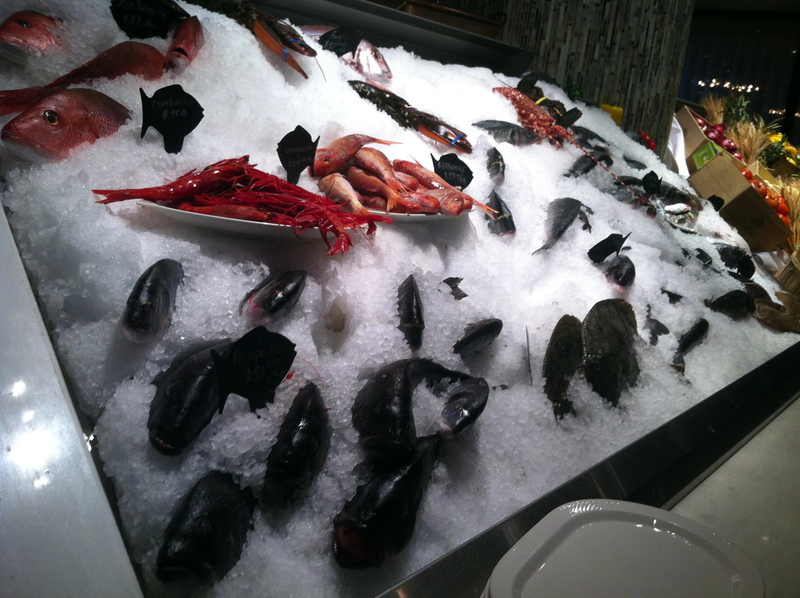 Yet I thought I would lead with that photo instead of my delicious plate of food, as I was a little bit drink to the drunk drink when I took the other photos so they’re not nearly as sharp this wall of ice and seafood. I mean I was in Las Vegas. If you’re not drinking to excess you’re probably at the club snorting bath salts. I guess? I’m actually not a Vegas expert. 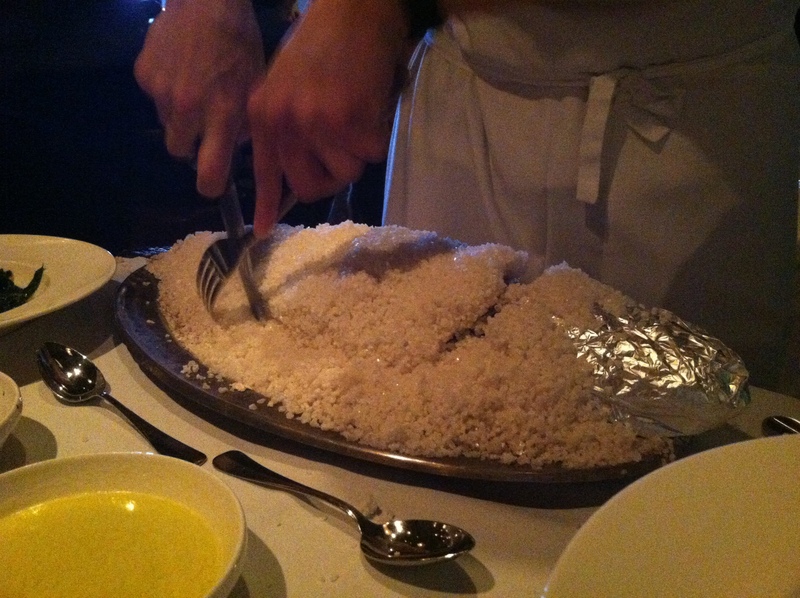 That’s a huge fish baked in salt (not of the bath variety). I don’t know what it does to that fish, other than making it delicious, but it looks very cool when they drop it on your table and get to carving the sodium off and serving it up, like so. I had the tomato salad, grilled octopus, and whatever that delicious fish was hidden inside all of that salt. I do believe that is a side of some kind of scrumptious greens as well. I forget. The wine, you see. The fabulous mineral-y Greek wine. Mmmmm, wine. 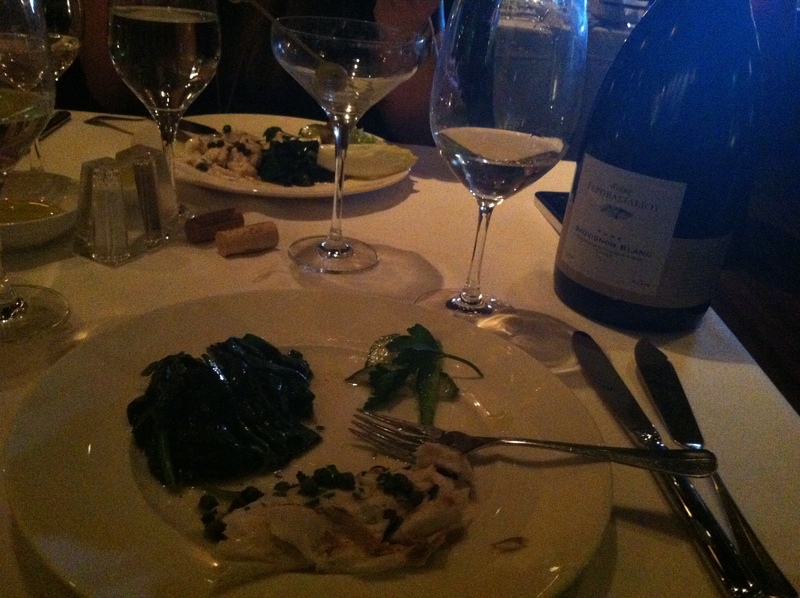 It was a super duper delicious meal, and our waiter was totally on the gluten-free tip so I loved him. Everyone else I dined with totally hated that guy since he was a bossy jerk (they say, hey, I’m still on team sassy waiter). Even if you get a crappy waiter at Esitatorio Milos, almost everything is gluten-free so you can dine in a group and not embarrass yourself as much as usual. Unless you drink too much wine and try to convince a divorced couple to get back together. That’s me, keeping it classy. Where do you eat gluten-free in Vegas? April! I am new to your blog and am totally hooked!!!!! Great information and I love your humor and honesty!!!!!! Glad to see you are doing so well. Thanks Leigh Ann! And welcome. The last time I was in Vegas was before The Diagnosis… I ate gourmet burgers and drank lots & lots & lots of beer…. I had major digestive issues on the flight home. Ahem. Good to know I have options for next time. 1. The Mesa Grill inside Caesar’s palace, It’s a burger like place. first time we went, i ate the fries (no issues) second time they said I couldn’t have them (jerks) so I had a hamburger patty and a salad-they are super friendly/helpful and I don’t have to shake them down, and they have THE most amazing burgers I’ve ever eaten. 3. PF Changs inside Planet Hollywood-what more do I need to say? Let me just add, I am not above shaking down the waiter, the one who takes my order, the one that delivers it, and even the manager to eat GF, The America restaurant had the nicest waiter, and he assured me my food was GF because his wife is GF and she ‘nags’ him about the ingredients. I’ll eat there anytime!